It looks like you’ve just found your beachfront holiday accommodation Broadbeach. 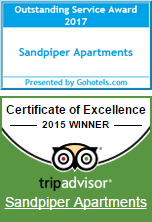 Here at the Sandpiper Beachfront Apartments you can enjoy easy access to the Pacific Ocean from our wonderful Gold Coast resort. 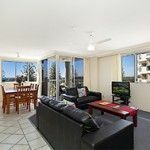 Here you will find spacious one and two bedroom apartments right in the heart of exciting Broadbeach. This part of the Gold Coast has the shopping, dining and nightlife to make your holiday the perfect balance of fun, excitement and relaxation. Each apartment has a balcony with deck furniture, Foxtel for keeping up with sports and entertaining the kids. There’s a fully equipped kitchen for a self catered holiday and the nearest Woolworths in the Oasis Shopping Centre is just a three minute walk. Singles and couples will love how close Broadbeach is to Surfers Paradise. 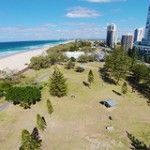 You can enjoy the vibrant and energetic Surfers, but pace yourself here in Broadbeach with the sun, beach and laid back park lands. Have a day on the beach, it goes for miles, but for a super safe swimming experience, the beach directly in front of the Sandpiper Beachfront Apartments is surf patrolled by the Kurrawa Surf Life Saving Club. If you want to give yourself a break from cooking, the Kurrawa Surf Club is a handy option. Their smart new restaurant and bar is a great place to wind down after a day on the Gold Coast. Whether you’ve been to the theme parks, or shopping, you can wind down with a cold drink, a view of the ocean, and order your dinner from the grill. Also closeby is the Pacific Fair Shopping Centre. They’ve had some recent upgrades with plenty of new cafe, restaurant and bar operators to keep the entertainment fresh and interesting. 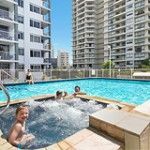 You do not have to leave Broadbeach for a great holiday on the Gold Coast.